Castlerigg Stone Circle is probably the best-known prehistoric stone circle in North West England, perched on the slopes to the east of Keswick inside the Lake District National Park. We will probably never know what our ancestors were doing, building these things. 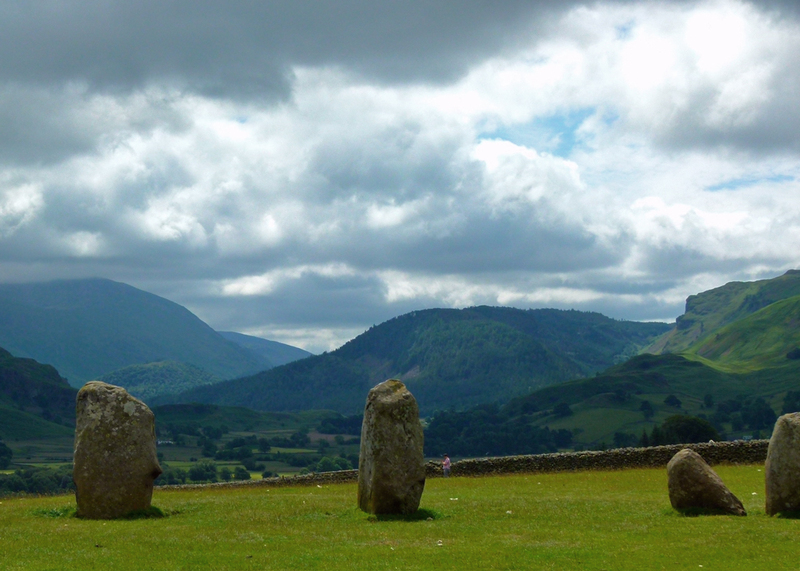 Perhaps if you visit Castlerigg when there are few other people about, the stones will talk to you. This could be a challenge, given the rarity of chattering stones these days, coupled with the fact that Castlerigg can get as busy as IKEA on a Saturday afternoon. 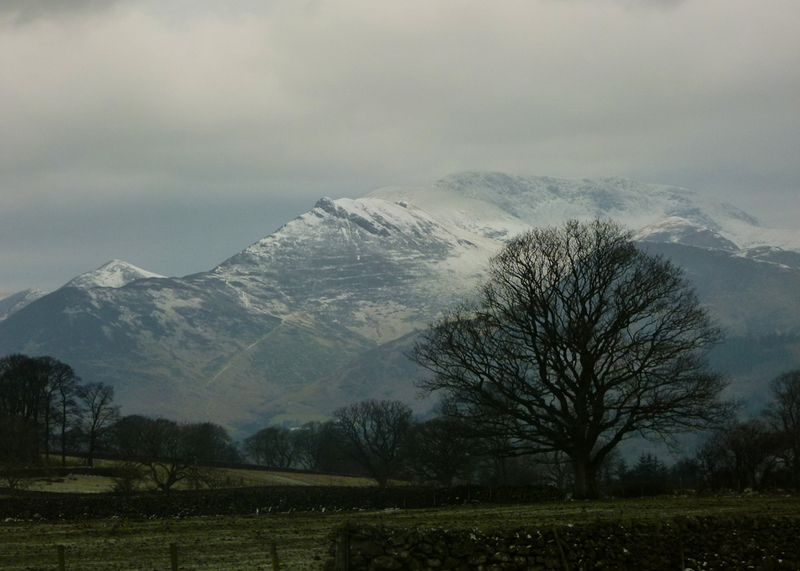 But the location is superbly dramatic, surrounded by the Cumbrian Fells, so it is worth dropping by for that alone. To the north towers Blencathra; to the west, Skiddaw, to the south, High Seat. Standing inside Castlerigg Stone Circle has been described as like being in a natural amphitheatre; anyway, get the right light and it is an atmospheric place. Somebody went to the considerable bother of setting up Castlerigg about 5,000 years’ ago; and it can’t have been easy. 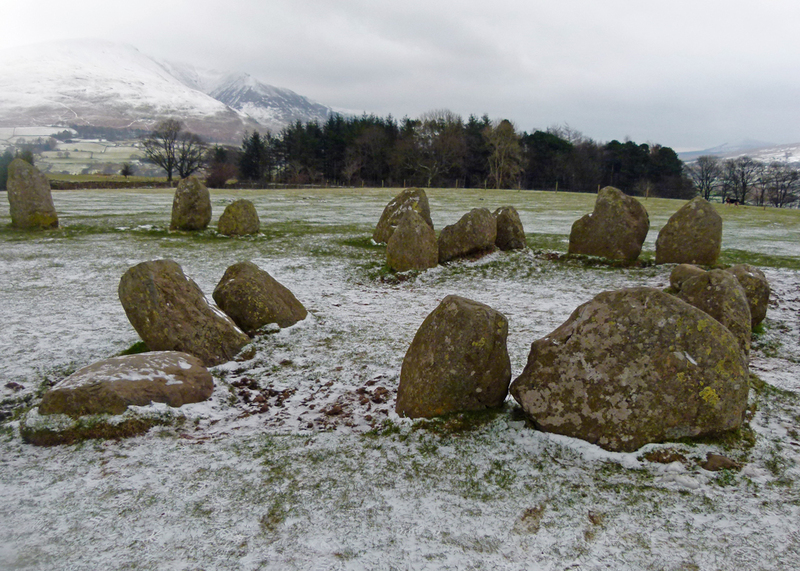 There are said to be around 1,000 stone circles in the British Isles – a feature of the late Neolithic and early Bronze Ages – and Castlerigg is one of the earliest. It’s roughly 100 feet (30 metres) across, not a perfect circle, and used to consist of forty-two ancient, local, stones. There are only thirty-eight of them now, and they vary in height above ground from 3¼ feet (1 metre) to 7½ feet (2.3 metres). That said, some folk will tell you that the number of stones varies…and in 1919, a climber is said to have seen strange balls of light moving among the stones…in ideal conditions, you could spot large, pink, bunny rabbits. Within the circle is a group of a further 10 stones in a rectangle forming what is known as the sanctuary, or cove – the purpose of which is unknown. At the northern end of the circle, two larger stones flank what was probably an entrance. Three stone axes, now in Keswick Museum (and originating from a Neolithic axe factory on Great Langdale nearby) were found in 1875 and the sanctuary was excavated in 1882, revealing nothing but charcoal. The site has never been extensively excavated, however. Curiously, the earliest known record of Castlerigg Stone Circle only dates back to 1776, in an account by the antiquarian William Stukeley, who visited it in 1725. Intriguingly, Stukeley mentions another circle in a nearby field – but no trace of this has ever been found. There may be significant astronomical alignments in the construction, which might have meant something to the builders in around 3,000BC. Or maybe they intended it as a meeting place, for trade or ceremonial purposes – or both. All jesting aside, we can but visit these places and wonder. Castlerigg was one of the first scheduled ancient monuments in Britain in 1883. It is owned by the National Trust and cared for by English Heritage. Or maybe it’s the other way round. Anyway, you’ll find it about 1½ miles east of Keswick on a minor road, signposted from both the A591 and A66. There is limited parking in a lay-by. Take stout shoes – it can be wet and muddy. Just wondering about Castlerigg Stone Circle. Do any of the stones or inner circle record the Solstice or an Equinox?. Have Time Team ever recorded any programmes here? Hi Frank, thanks for dropping by and leaving a comment. I’m no expert, but am not aware of any significant astronomical alignments in the construction of Castlerigg Stone Circle and don’t believe Time Team has recorded anything there. For me, one of the fascinating things about Castlerigg and other, similar, places is that we just don’t have a clue why our ancestors went to so much trouble to build them. Yes, I have heard of that of course – looks amazing! Thanks for following my blog, which is much appreciated. You have some wonderful and unusual features here on your blog. 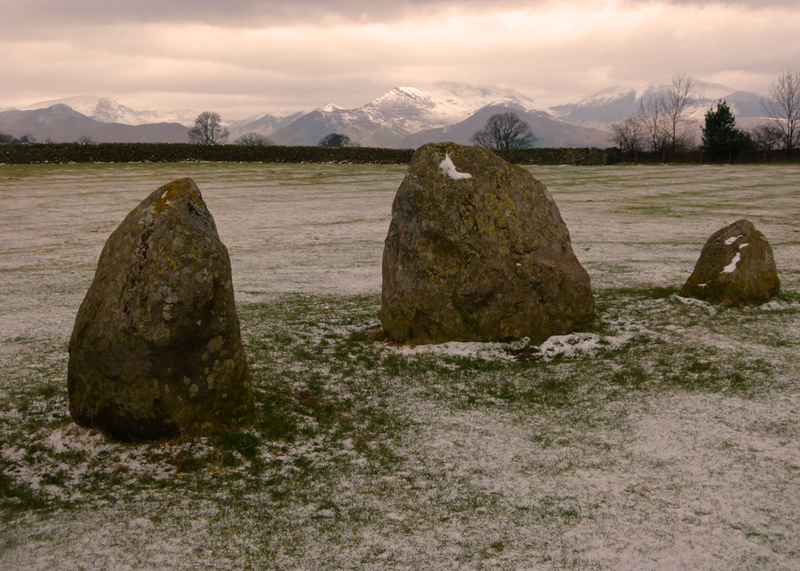 I am guessing you will have spotted my own blog post about Castlerigg? No, I’m sorry, I haven’t – I’ll take a look now! Top of my ‘places to visit’ list! Lovely shots. I love this place, too, and have been there many times, I have relatives who live in the area, so I’ve been visiting Castlerigg since I was a child. The last time was a couple of years ago now, but it never changes, does it? (Except for its moods, dependent on the weather up there, as you say.) You have some great photos of the site the ‘snowy’ ones are lovely. As you said in your post, it’s so often wet and muddy in that field. I enjoyed the great historical detail and other interesting snippets, so thank you for sharing them. I always find stone circles or any kind of standing stones fascinating. I find those old stone circles absolutely fascinating. When you put them together with the building skills that built a place like Maes Howe, it must have been a very advanced society in certain ways. At last you have written about a place I have visited. It was a nice clear day but windy and cold. There weren’t many people there on that day but it was back in 2009. I always look and wonder at these sort of things. I sometimes think there was a lot more to our past history of civilisations. The book ‘Chariots of the Gods’ was believable for me. I’ve never been to Castlerigg. It’s not really my corner of the word. Nice to see your photos. We must have been very lucky in our visit to Castlerigg as there were only two other visitors. We visited during the late afternoon in July a couple of years ago; the sun was shining , the sky was blue and it was warm! We had a wonderful time there! Thanks for the history of the place and all these wonderful photos! It’s good to see photos from different seasons. We were there in May of 2006 before we owned good digital cameras. I wouldn’t mind revisiting the Lake District with my digital camera in hand. Thanks for all the info, Mike! One kind of wonders why Stonehenge gets all the glory when there are more impressive sites in Britain. I can’t recall hearing of it before, but these stone circles and other constructs from thousands of years ago fascinate me. The landscape is amazing… the Lake District is one area I’d love to visit someday. Excavating it could be interesting indeed. I have scottish ancestry in both the highlands and lowlands and would love to travel around the country. So intriguing! Thanks for this well-written and interesting post. I love places like this with something of a mystery! No matter the weather, I imagine it is rather impressive any time of year. But as busy as IKEA on a Saturday – no, thanks. I like IKEA (half my flat’s contents are from there), but I hate the inconsiderate throngs of people that sometimes you can not avoid meeting there. Absolutely stunning. I wonder why my great grandparents left this area of England with it’s natural beauty. Your photos and fabulous. My astronomer husband would love to check this out. Maybe cold, wet and too few jobs? Hi Mike – I think you’re right in one respect – the most important of two … we will never know and we need to marvel quietly at our ancestors abilities. 2ndly – I feel the laybye for parking … isn’t good enough for the Ikeaness of the place?! Yes, it can get crowded, Hilary. But people walk there too, of course. Fantastic photos and account Mike! I wish we could have made a short detour from our Coast to Coast to visit the place.